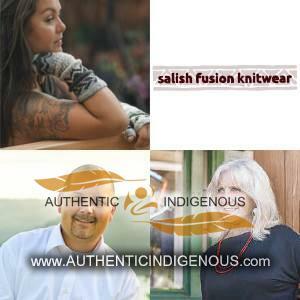 Salish Fusion is a collaborative effort between Joni, Adam and Sylvia Olsen. Growing up on Tsartlip First Nation surrounded by wool, sweaters and knitters like our Grandma Laura, we harnessed the passion of our mother Sylvia and her extensive knowledge of Coast Salish knitting to re-invent our family business. We started three decades ago as Mt. Newton Indian Sweaters, buying and selling sweaters, today we do a whole lot more! Each piece we create takes on a life of it’s own. Inspired by Coast Salish knitting tradition we have incorporated felting and a Brother KH-260 bulky knitting machine and we produce high quality, diverse, functional art. As fibre artists, the wool is our canvas so the quality of the wool is critical. We use locally sourced wool which is transported to Alberta for processing. The wool is machine spun into two weights, lopi and single-ply. We use five colours in our process, white, three shades of grey and dark brown. Felting has added a new dimension to our final product, the material we create can be used in any application from apparel to furniture. Our final touch is a careful shaving to remove the fuzzy fibres and any pills that have formed. This is when the piece reveals itself, the colours in the wool spring to life. Our pieces are designed to be used, they are durable and have proven to stand the test of time. Our audience seeks a finely made, hand-crafted piece that celebrates the Coast Salish knitting tradition.